Isn't this a clever display option? 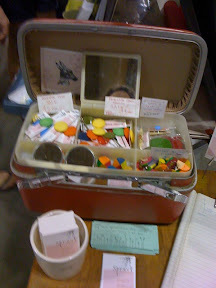 I saw this train case display recently at a local crafts show and was very impressed. I actually have a couple of these vintage train cases that I've found out junking. Didn't have an immediate use for them but couldn't pass them up. Unfortunately, I don't have the patience to do craft fairs (plus I'm too shy) but I thought I'd pass on this great recycling idea to those who do.